I located this school up on a 30 foot flat first thing in the morning. After setting out down lines we started catching fish. This pic was taken 30 minutes after I found the school. I had dropped a bait to the bottom [straight line on bottom left of screen] which hooked up immediately when it hit the edge of the school. 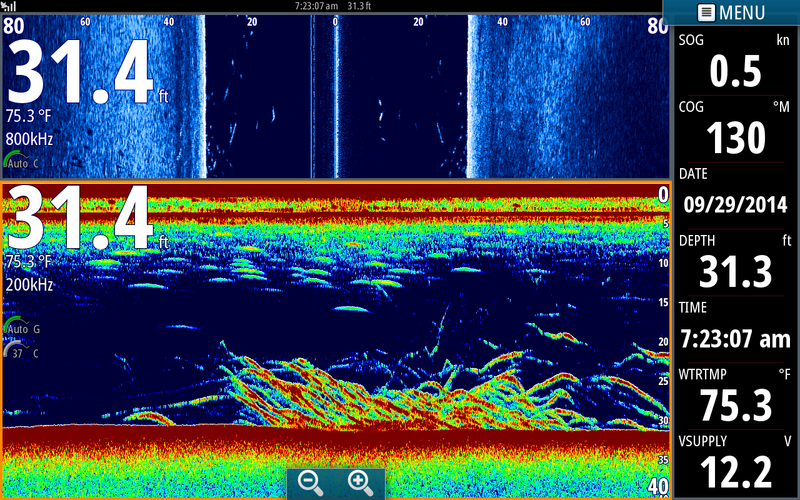 You can barely see the fighting fish in the middle of the screen as it is being reeled in [Between 25 to 15 feet]. The fish was on the edge of the cone angle of the transducer therefor it was not very clear. These fish were on the trailing edge of the school and were all punks. They were not keepers but were fun catch. Using my side scan I determined the school was moving deeper on the flat so I steered the boat in the direction the school was moving. We were steadily catching Stripers but the larger fish were at the top of the school. We raised the lines up to 23 feet as you can barely see [very light horizontal line at left of school] then two thirds of the way across it hooked up rising up to 15 feet then the fish dove back down into the school. We had numerous fish on at this time and fish in the boat that we were taking off the hooks therefor we could not reel this fish in for a couple minutes. I had temporarily lost the school in this pic and was over a small pod of punks. 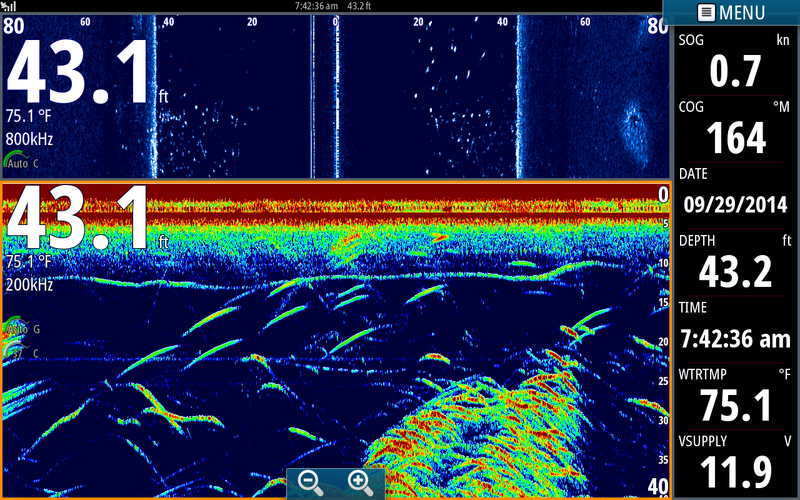 I saw some larger fish off to the right of the boat so I steered the trolling motor that direction. 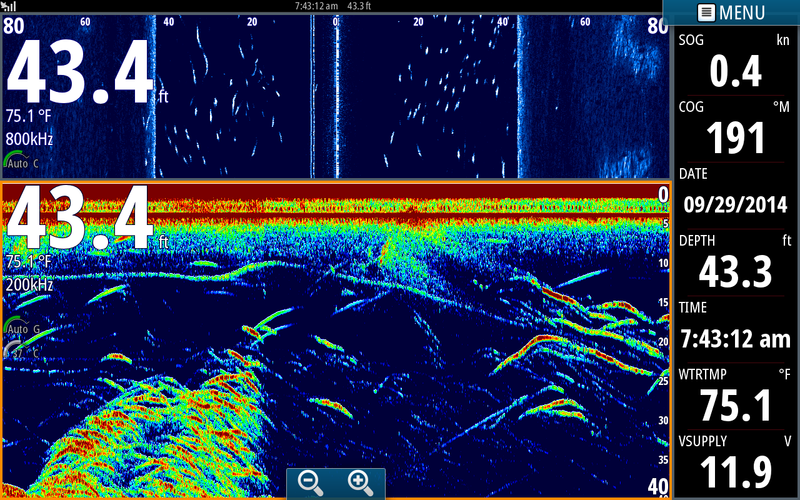 You can clearly see our bait about 10 feet deep [horizontal line at 10 feet]. We had raised our baits up this high because the nicer fish were feeding in the upper water column. My move paid off in this shot. Just a minute after I turned the boat and got away from the punks we hooked up with nicer fish. We continued to catch nicer fish for quite awhile but I was too busy to pop more pics. I could have never stayed on this school without the aid of my Side Scan. 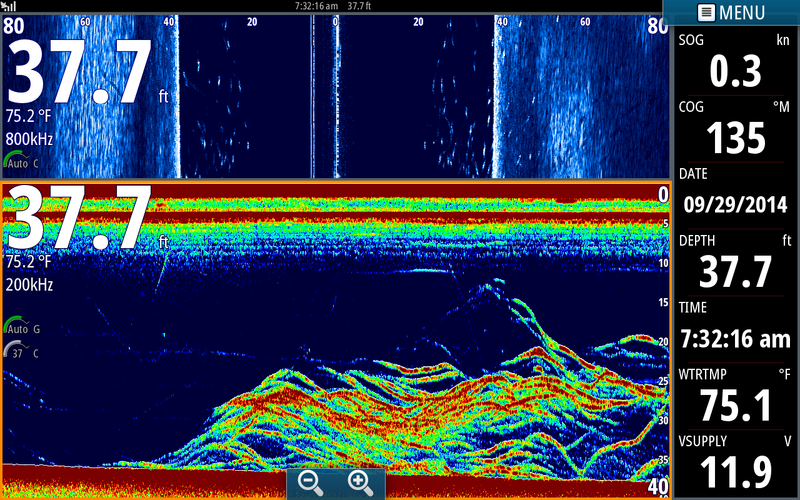 Simrad and Lowrance have made my job SO much easier and productive. Technology has come so far in the last few years it is a shame for anglers who have major investments in fishing [boats, tackle, vehicles, etc.] to continue to use outdated depth finders. In addition to Structure Scan, today's electronics have features like touch screens that allow you to quickly navigate through menus and are simple to use. If you purchase a unit from Greentop they will even program the unit before you leave the store to set the unit up for the waters you are using. I have been primarily focusing on Structure and Echo uses of my units but but when you incorporate the technology of Navionics Charts the fish almost don't stand a chance. I will try to take time to post some cool uses of charts in the future. For more information on Navionics, contact Thomas at Greentop. He is extremely knowledgeable about Navionics and also is a regional rep for Navionics.